Asus produces high-end gaming computers through its ROG brand. 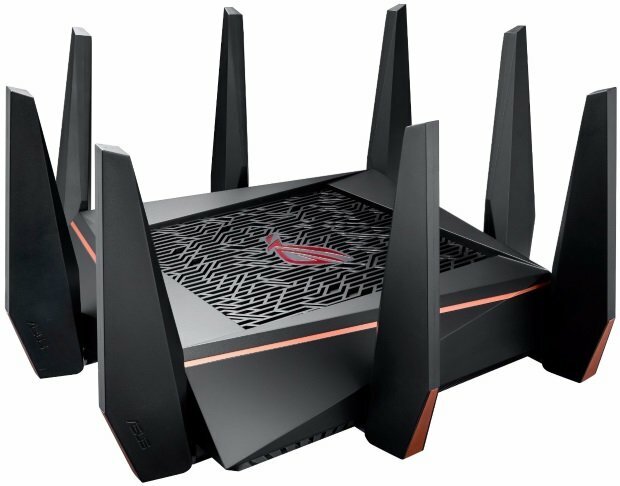 The Taiwanese company is now expanding its router lineup with Asus Rapture GT-AC5300, which has been designed and developed especially for gamers. A router targeted at gamers needs to be blazingly fast and support multiple Ethernet LAN ports. Moreover, the administration interface must display network performance bottlenecks. The new Asus Rapture GT-AC5300 meets all these requirements. It’s a tri-band router and supports two 5.6 GHz networks and one single 2.4 GHz one. The maximum bandwidth reaches 5.3 Gbps. Gamers typically hook up together in one location and establish a LAN network. Asus Rapture possesses 8 Ethernet LAN ports with Gigabit capacity. It’s possible to combine two links into one hyper-fast 2 Gbps link. The administration interface is comprehensive and yields an easy to comprehend overview of the networks. The network’s security is ensured using Game IPS, which is an Intrusion Prevention System. The Game Boost feature optimises network speeds by prioritising data packets and supports major consoles like Xbox One, PS4 and Nintendo 3DS. Another cool feature is Game Radar that reports the latency of different games worldwide. The quad-core 1.8 GHz processor is powerful enough to power Rapture’s advanced features and performance. In short, Asus’ newRapture GT-AC5300 router delivers the speed that gamers need.